Mr. Williams’ brother, Kevin Williams, filed suit on behalf of his deceased brother against the Sheriff and the guards. After getting past numerous barriers and motions to dismiss, the trial of that lawsuit is now under way in Tulsa. The evidence showed that Mr. Williams had broken his neck by hitting his head against his cell wall, which caused him to become paralyzed. During opening statements Thursday, Clark Brewster, an attorney for the Sheriff’s Office, said Williams didn’t die in Tulsa’s jail from a lack of medical care, but instead committed suicide. On Monday, Smolen asked McKelvey whether anyone notified Chief Deputy Michelle Robinette, who was supervising jail operations when Williams died, of Williams’ neck injury. Jail policy required inmates’ self-inflicted injuries to be reported within 24 hours. You can follow the trial through The Frontier’s reports. Now consider the fact that Mr. Williams was paralyzed, was begging for medical care or just any help, was not given food or water or any medical attention, not even checking vital signs or checking to verify he really did just become paralyzed in his cell, for six long days. 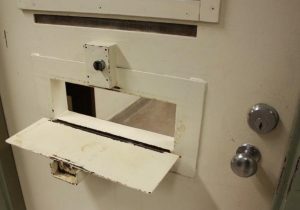 He laid on the floor of his cell, on a soiled blanket, naked, begging for six days, without a jail guard so much as lifting a finger to help him. That really is treating Mr. Williams worse than we would treat a dog, isn’t it? And don’t you think that if the way an inmate is treated by jail or prison staff is “worse than the way we treat a dog,” that, by definition, is “deliberate indifference” to his constitutional rights?